Friends of Nelson has launched a No Pipeline! video contest, with a one thousand dollar prize for the winner. The contest is open to anyone, including those fighting other proposed natural gas pipelines. Entries must mention the Atlantic Coast Pipeline by name, the high-pressure, large-diameter pipeline proposed to run through the Allegheny and Blue Ridge Mountains, Monongahela and George Washington National Forests, the Appalachian Trail and Nelson County on its way to the coast and NC, but can include other projects or mention any of the myriad issues raised by new natural gas infrastructure. 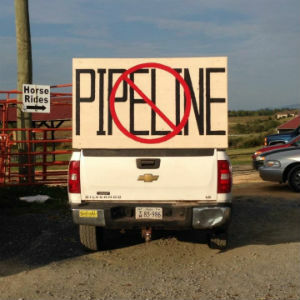 “Given the unprecedented build out of fracked-gas infrastructure our nation, and the East Coast particularly, is facing now, we wanted to cast as wide a net as possible, both in terms of who may submit entries, and in terms of issues,” says Deirdre Skogen, Friends of Nelson’s networking and communications coordinator. “Accelerated climate change, eminent domain abuse, erosion and sedimentation concerns, delayed transition to a clean energy economy, stranded fossil fuel assets paid for by captive consumers, dirty air emissions from compression stations, morality of eminent domain for export– these issues and more are all fair game,” she continued. “We hope that this contest, and the videos that come from it will help raise awareness in urban areas of the true consequences of the “Fracking Boom.” More and more of us in rural America are experiencing first hand the frightening loss of personal and community sovereignty as we are forced to “host” these dangerous pipelines and compression stations, turning our homes and communities into sacrifice zones, and wasting the resources that we all depend on — and for nothing but to enrich the very few,” says Joanna Salidis, President of Friends of Nelson. Three minute or less video entries must be submitted via email to friendsofnelson@gmail.com as links to a YouTube video before midnight on Dec. 27th. Full contest rules can be found here: friendsofnelson.com.